Nintendo will host its E3 press conference on Tuesday 5th June. 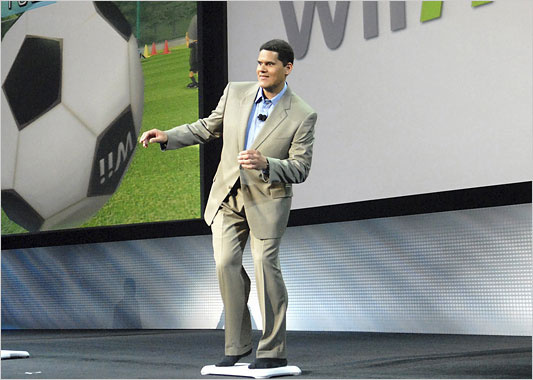 It'll be our first look at Nintendo's Wii U games including Pikmin 3 and Super Mario Bros., plus new games for 3DS. We'll be bringing you live coverage as it happens so make sure you're glued to your internet-enabled devices on 5th June. That's in 34 days. I'd rather read NintendoLife and their excellent coverage in the morning. Noon for me. I have no idea what my obligations will be for that day as of this time, but I'll be sure to cancel/postpone as many of them as possible. I have a bro who plans on watching it with me; he loves Nintendo so much that these E3 conferences often make him emotional, so this should be fun. E3 is always exciting! I wish I could see it in person. Woot! That's 6 PM in my summer vacation, perfect timing! 9 AM, damn. Time to fix the sleep schedule. Gone are the days when I used to have to stay up until 4am on GameSpot. 2am Wednesday morning, sounds great. I wonder if Microsoft will also reveal their new console...well, we'll see. Well, that's 6pm for me, excellent timing! As for new consoles from other parties - well, Microsoft kept X360 secret virtually until last moment, so it is somewhat possible, but unlikely (X360 is still very capable). Sony surely won't announce anything, knowing how they like to show their systems early and then think about how they are gonna fit the innards into the mockup they've shown. I'll still be in school...damn it. I can re watch it on nintendoe3.com so whatever. 11am, just an hour before my class starts at noon. I can't remember, they don't usually take more than an hour do they? DO THEY!?!? The queen was crowned exactly 60 years ago specifically so that I could have a day off to watch Reggie do his thing. What a girl. 9AM! i will be at school! 12pm at school. Darn it. 12 PM for me, I'll also be in school. I'm watching it when I get home I guess. 11am for me. Does anyone know if they'll be doing a Nintendo Direct broadcast of the whole thing? Now one of the nicer reminders in my digital calendar. And since it's starting at 6pm i shouldn't have to make any concessions to watch it. Noon for me... Pretty inconvenient. 7pm in the beginning of summer vacation, what a nice way to start summer vacation. Midnight here, works for me! Been doing it for a couple of years now. That's Noon on my vacation I believe (It was last year too) so if it weren't for the crappy internet there I could watch it. 12 PM sounds just right to me like usual for Nintendo. I just hope that they announce a Mario & Luigi 4 for 3DS or Wii U as one of their announcements. Alright!!! Here we come June 5!!! gotta love living on the eastern side of canada!!! NOON IT IS!!! Can't wait! It was the same time last year I believe, wasn't it? 10:00 am, just in time for my morning coffee break... of 15 minutes . I wish I didn't have to work. You can bet I will be on here all day long though. How long will the conference be? Noon for me going ti be the third year in a row where I watch it along with the rest of e3. 11:00 A.M. For me. Hopefully I have the time to watch it. Watched it the past two years, very exciting event. So you NL staff will be covering it on this site from 9:00am right? Just to be clear on something I didn't make sense of earlier when I referred to me saying, I just hope that they announce a Mario & Luigi 4 for 3DS or Wii U. I just mean't that by as the way they're doing a Paper Mario game for the 3DS , I don't see the harm of Nintendo or AlphaDream making one for either the same portable. Or maybe it can be done for the Wii U.
Corbie goes to e3 and does a liveblog. I'll try to be watching. Last year I was interrupted often. I will cross my fingers for Animal Crossing and (mostly) Paper Mario. Its great that the 5th June is bank holiday this year. That means I get a day off college for all the e3 news. I have an idea. I'll just impersonate as Newton, they have to let me in. Bank Holiday! For once I can watch it live! I would have liked more than just an hour. Feels like Nintendos show is gonna be the biggest of the bunch this year. But I guess one hour will be enough as long as they skip the "our 3DS system is selling great" 'show sales numbers picture' stuff. Hopefully it'll be an hour to remember. 5pm for me, unless i have other commitments that day. Will it be covered by this site? That'd be awesome. If I didn't need to maintain my perfect attendance I would TOTALLY...contemplate skipping for more than a few minutes. 5pm. Perfect! I can enjoy dinner whilst seeing the latest announcements. Pikmin 3 will look wonderful I'm sure. Noon for me, it will be on while I will be at school. Aww, darnit, it's gonna start right when I'm almost done doing my final exam of the year. Well, looks like another mad rush home. Noon! Awesome! This year I WILL watch it live. Now I just need to set up the E3 party I've been wanting to do. 1:30 of reaction guy reenactments and the rest of the day of games. 10am... I already got the day off work to watch it too! Hopefully I will be awake by 9am. but, still, YES! It would be nice to see flipnote memo at e3. They should release it shortly after because its been a year since it was announced. Yay! No matter what, I won't be at school! I can just walk over to my computer and watch! 7pm, that´s been official E3 time for me for 6 years now. ... unless they started at a different time some year. I want to know when Luigi´s Mansion 2 is going to be released... and those other games too. 5pm. Hmmm. I might be difficult to watch it and have my dinner at the same time.